Nantes&Co.fr is a web platform created by the community aims at accelerating the dialogue between different citizen initiatives. It allows discovering projects and news of the city organised by district. Accessible from all the city, Nantes&Co.fr is an additional means for people who cannot make attend neighbourhood meetings and make their voices heard. This application was launched in January 2016. 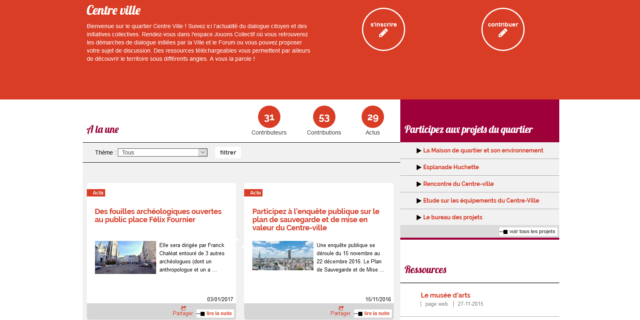 Play Collectively: Users can find all the procedures for dialogue proposed to citizens by the City of Nantes, in the neighborhoods: news, documents, modalities of participation in citizen workshops, concerted development projects, reflections on local life, participatory events. It is also possible for users to contribute online or submit a new point of view, a testimony, an idea. Forum: For each neighborhood, the forum is the place of free discussion around the local life. As a citizen, people can exchange and express themselves freely and create discussions on topics that interest them. However, this forum is not a space for interpellation of the City of Nantes. The application is currenly used by the citizens of Nantes.